Products with VAT included show a price calculated with VAT tax, so the additional tax of 22% is already added to the price of these products. The products with VAT Margin apply the additional tax of 22% only on the margin, the difference between the price at which the product is purchased and the price at which the same product is resold. 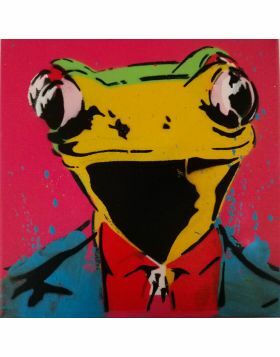 With this series of 20x20 cm canvases, Mr. Savethewall homages some of his most famous subjects. In this case the protagonist of this canvas is a sweet little bird, symbol of freedom, that is humming on a branch and is surrounded by a beautiful yellow background. Unique work on canvas, signed in original by the artist. The work is given with the certificate of authenticity. Registrandoti potrai scaricare un template del certificato di autenticità e/o immagine HD. Registrati e fai reload della pagina.